Joan! It’s been a long time since my last letter to you. Three furtive trips to Barcelona, as many to Mexico, and among ones and the others I’m trying to settle in the city that is now taking me in. I spend my days in airports and planes, always with two or three books, my computer, eye drops and a comfortable dark blue tracksuit that has sparkled many funny situations (the last one yesterday, when a woman asked me if I had come to Mexico to compete, convinced by my outfit and the vegetarian food I was served in the plane). Among all these comings and goings there have been many wonderful encounters, inspiring people and projects I’d like to write to you about. But let’s go step by step. 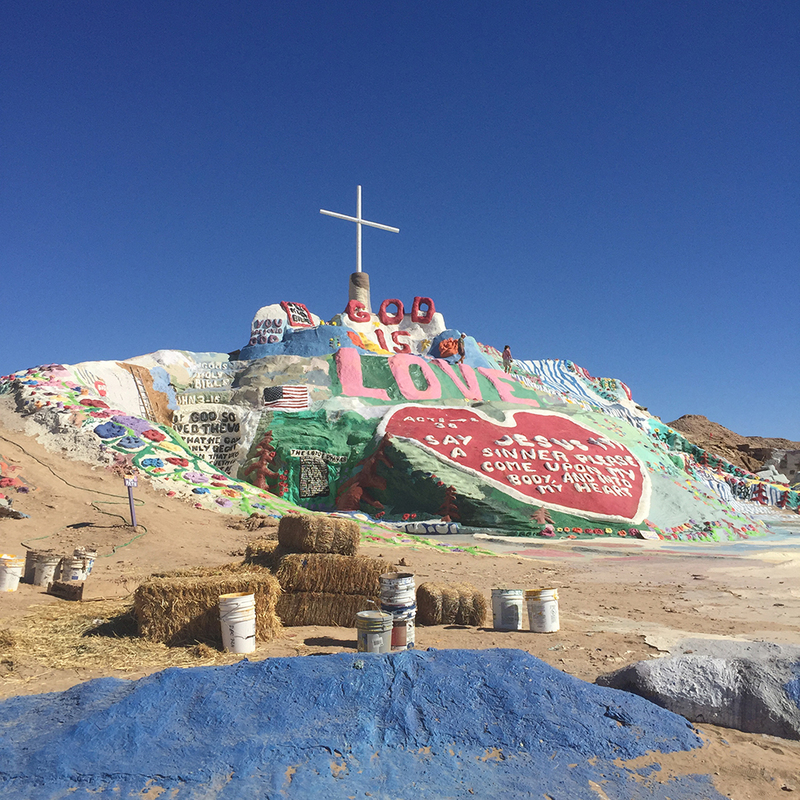 Today I want to tell you about Salvation Mountain. Does it ring a bell? My approach won’t be a weepy one, and I won’t take advantage of the situation to praise or defend love. It’s more an attempt to share the discovery of an unusual story, that of a man and a mountain, of the aesthetic fascination it produced on me and the reflections on artistic creation that this caravan trip to a place 190 miles away from the house I live in Los Angeles invited me to do. After more than three hours riding on never-ending straight roads and a brief stop at Salton Sea (a Martian place that was very well portrayed by Alma Har’el’s documentary Bombay Beach), we get to Salvation Mountain. The vision of the colourful mount, of a lysergic nature, in the midst of the south Californian desert, under a roaring sun, left me speechless. Around it there’s nothing except desert and a few old cars that people have abandoned and started decorating in the same colours of the mountain, and that now seem the product of a natural mimesis: surrealist, technicolor, psychedelic, kitsch, folk, insane and wonderful at the same time. Love seems to be its central theme, with a ‘God Is Love’ message crowning the mountain. Hearts, vegetal ornamentation, flowers, birds, organic dots and lines: Biblical quotes are mixed with the hippie imaginary in this artificial mountain made up of clay adobe and bales of hay and thousands of kilos of white, blue, pink, yellow, red and green plastic paint shining under the sun. A few tourists come with us to visit the mountain. We surround it, and climb the steps up to its peak, crowned with a white cross. We visit its interior galleries, take some pictures and get ready to cook in the caravan and eat under the canopy, looking at the mountain, mouths agape. This tourist attraction, ignored by the government and any entertainment companies, is ruled by common sense and no norm prevents us from setting up camp there, a few metres away from the mountain, for a few hours. The origin of this mountain is a story of passion, uselessness and determination. Leonard Knight, an American army veteran who fought in the Korean War, lives a mystical experience that makes him approach the Christian god. From then on he will devote the rest of his existence to communicating his message of universal love. After a not very successful attempt of elevating to the sky, for everybody to see, a helium balloon showing his message, he decides to create a mountain in the midst of the Californian desert. In 1986 he initiates his first monument, a mountain made of concrete, sand, tree branches and scrap metal, most of them elements found in the desert. In 1989, after almost four years of intense work, the mountain falls down due to the lack of a stable structure, since it’s built following organic accumulation. In another instance of the tenacity and push of his faith, he undertakes the adventure of raising a second mountain taking as a base the remnants of the first. Having learned from his failure, he improves his technique and decides using adobe, covering it up with a thick layer of paint. Ten years later, the mountain becomes known in the surrounding areas. The US government starts feeling uneasy about this activity being carried out on its territory without its permission, overview and benefit. So it declares the area toxic and orders the demolition of the mountain, claiming the land is being polluted by the metallic components of the paint. Despite all the pressures, Leonard won’t be stopped: he gets thousands of support signatures as well as an analysis by an independent lab that proves that the negative impact of the materials used in the building of the mountain isn’t relevant for the environment. He wins the battle, goes on with his project thanks to donations and the work of volunteers, attracted by his enthusiasm. In 2001, Salvation Mountain is declared National Folk Art Site by the Folk Art Society of America; a year later it’s declared a national treasure of the USA: a radical change of status. During all this time and until 2011, three years before his death, Leonard lived in his truck, at the foot of the mountain, where he relentlessly worked under the desert’s scorching sun. The mountain has also an annex, a house with a vaulted roof of Native American inspiration that Knight built but where he decided not to live. It also holds a museum, an ambitious work in progress consisting of a series of galleries with vaults held by pillars made out of tyres, in a structure of trees and adobe. Leonard wanted to show inside these galleries the documentation of the mountain’s creation process, its history. I found the mountain aesthetically wonderful, but what often comes to my mind since I visited it is its history: Leonard, like Sisyphus, constantly building with his own hands a mountain that keeps on destroying itself, insistently applying layers and layers of paint that keep on being absorbed by clay until they disappear. He said that he had painted it more than twenty times, and it has been painted again and again after his death. I think of Sisyphus, but I don’t see here a component of punishment, of condemnation, as in the Greek tragedy. It has more to do with the absurd, with heroism, with uselessness and joy, topics we should ask Albert Camus about in relation to his reflections on the Greek myth. Leonard claimed he was happy building his mountain. His conviction and his faith gave a reason to his perseverance, and his project gave meaning to his life. At Yelp there are more than 750 photographs of people who have visited the mountain; it was featured in Sean Penn’s 2007 film Into the Wild, also in the music video for Coldplay’s Birds, and in a million fashion editorials (or that’s what it seems after a quick Pinterest search): a history of faith, and a monument to love, turned into a pop icon. This fantasy world created by Knight also appears quoted in many outsider art references, inside that difficult to define category that many refer to as well as art brut (according to Dubuffet) or ignorant style (for graffiti experts). I found out about this by chance, with the precaution of someone that has only half-read Foucault’s History of Madness and knows how to doubt anything of what all through history has been qualified as mental disorder. This art is opposed to high art, an opposition being already quite complicated and erratic. From the analysis I read on the theme I extract but one idea: that of liberated art. The artist doesn’t feel the constant pressure to innovate, the need to be recognised, and completely ignores the history of art and the context of contemporary art. Those artists labelled as ‘outsiders’ are self-taught, amateurs, have no artistic studies, no PhDs, no Master’s degrees, no residencies, but are compelled by a need to create non-stop. Sometimes they don’t even have paint or materials and so they scratch walls with stones or embroider with threads they take out of their own sheets. In many cases, their activity is initiated after a trauma, a mystical experience or a vision. In their work, ornaments grow organically and the lack of previous planning is quite obvious. Spontaneously, shapes end up building a whole, in a constant improvisation that is the sum of its parts. A horror vacui takes them to fill the space with vegetable forms, organic and rounded, conquering the whole space without knowing when to stop. Writing appears quite often as well in works classified as ‘outsider art’, writings with a great plastic and visual component, close to graffiti, of an almost sculptural nature, like Leonard’s mountain. The fact they recycle, using materials at hand, and their sculptural and labyrinthine constructions remind me of Kurt Switchers’s Merzbau, a 3D collage. The difficulty to distinguish between structural and decorative elements, with a prominence of ornamentation, are common elements in Leonard’s project as well as those of other artists classified as ‘outsiders’. The common elements of what has been labelled as outsider art and those of Salvation Mountain are evident, but be it that kind of artwork or just a mere wonderful insanity, behind that mountain there’s the story of a tireless creative work, a life project of great devotion, of a joyful and vitalist nature, far removed from any notions of social and economical success, and with the only mission of transmitting to the world the idea of universal love. Coming from the city of the Hollywood Walk of Fame, kale salads, cold press juices, never-ending networking and red lipstick and expensive champagne inaugurations, finding this mountain is a bit like a hallucination. *(Footnote): Words written by Moreno Villa when talking about the adventures and misfortunes of the extraordinary Dr. Atl and his stubborn study of the Paricutín volcano. ME PIRO. NARRACIÓN EPISTOLAR AUTOBIOGRÁFICA FICCIONADA. Capítulo 2: Sobre Salvation Mountain. ¡Joan! Ha pasado mucho tiempo desde la última vez que te escribí. Tres viajes furtivos a Barcelona, otros tantos a México, y entre uno y otro voy intentando asentarme en esta ciudad que ahora me acoge. Paso los días entre aeropuertos y aviones, acompañada siempre de dos o tres libros, de mi ordenador, de gotas para los ojos y de un cómodo chandal azul marino que me ha provocado más de una situación cómica (la última ayer, cuando una señora me preguntaba si venía a México a competir, convencida por mi atuendo y por la comida vegetariana que me sirvieron en el avión). Entre idas y venidas ha habido muchos encuentros maravillosos; gente y proyectos inspiradores de los que quiero hablarte. Pero vayamos por orden. Hoy te escribo para hablarte de Salvation Mountain. ¿Te suena? Mi aproximación no va a ser lacrimógena, ni aprovecharé para hacer elogio o apología del amor. Es más bien un intento de compartir el descubrimiento de una curiosa historia, la de un hombre y una montaña, la fascinación estética que me produjo y las reflexiones sobre la creación artística que me ha invitado a hacer esta excursión en caravana a ciento noventa millas de la casa que me aloja en Los Ángeles. Tras más de tres horas por interminables carreteras rectas y una breve parada en Salton Sea (un lugar marciano bien retratado por Alma Har’el en su documental Bombay Beach) llegamos a Salvation Mountain. La visión del colorido montículo, de carácter lisérgico, en medio de la gran nada del desierto del sur de California y bajo un sol abrasador, me dejó alucinada. Alrededor de ella nada salvo desierto y unos cuantos vehículos en desuso que alguien ha ido abandonando y decorando a juego con la montaña, y que ahora parecen producto de una mimesis natural. Surrealista, technicolor, psicodélica, kitsch, folk, disparatada y maravillosa al mismo tiempo. El amor parece ser el tema central, con un ‘God Is Love’ coronando la montaña. Corazones, ornamentación vegetal, flores, pájaros, puntos y líneas orgánicas. Las citas bíblicas se mezclan con el imaginario hippy en esta montaña artificial hecha de adobe de barro y pacas de heno y de kilos de pintura plástica blanca, azul, rosa, amarilla, roja y verde que brilla bajo el sol. Unos pocos turistas más nos acompañan en esta visita por la montaña. La rodeamos, subimos por las escaleras hasta la cima, estocada por una cruz blanca. Visitamos las galerías interiores de la montaña, nos hicimos fotos y nos dispusimos a preparar la comida en la caravana y comer bajo el toldo y mirando con la boca abierta hacia la montaña. Esta atracción turística dejada de la mano del gobierno y de cualquier gran empresa de entertainment se rige por el sentido común y ninguna regla nos impide asentarnos allí, a pocos metros de la montaña durante unas horas. El por qué de esta montaña es una historia de pasión, de inutilidad y de obstinación. Leonard Knight, norteamericano retirado del ejército del que formó parte durante la Guerra de Corea, tiene una experiencia mística que le acerca al dios cristiano. A partir de ese momento decide dedicar el resto de su existencia a comunicar su mensaje de amor universal. Tras una tentativa poco exitosa de elevar a los cielos, donde todo el mundo pudiera verlo, un gran globo de helio mostrando su mensaje, decide iniciar un montículo en medio del desierto californiano. En 1986 inicia su primer monumento, una montaña de cemento, arena, ramas de árboles y chatarra, la mayoría de ellos elementos encontrados en medio del desierto. En 1989, tras casi cuatro años de intenso trabajo, la montaña se cae por falta de una estructura estable, construida a base de acumulación orgánica. En una muestra más de su empeño y del empuje de su fe, emprende la aventura de levantar una segunda montaña partiendo de los escombros de la primera. Habiendo aprendido de sus fracasos, mejoró su técnica y se centró en el uso del adobe, cubriéndolo después con una colorida y densa capa de pintura. Diez años después de iniciar el proyecto, la montaña empieza a ser conocida por los alrededores. El gobierno norteamericano empieza a sentirse incómodo de que esta actividad esté siendo realizada en su territorio sin su permiso, supervisión y beneficio. Declara la zona tóxica y ordena la demolición de la montaña, alegando contaminación de la tierra por los componente metálicos de la pintura. A pesar de las presiones, Leonard no ceja en su empeño, consigue firmas de apoyo y un análisis de un laboratorio independiente que demuestra que el impacto negativo de los materiales usados en la construcción de la montaña para el medio ambiente, son insignificante. Gana la batalla, sigue su proyecto a base de donativos y del trabajo de voluntarios contagiados de su entusiasmo. El año 2001, Salvation Mountain es declarada National Folk Art Site, por la Folk Art Society of America. Un año después es declarada tesoro nacional de los Estados Unidos de América. Un cambio radical de estatus. Durante todo este tiempo y hasta el año 2011, tres años antes de fallecer, Leonard vivió en su camión, a los pies de la montaña, en la que trabajó sin descanso bajo el implacable sol del desierto. La montaña tiene también un anexo, una casa de techo abovedado de inspiración india que Knight construyó pero decidió no habitar. También tiene un museo, un ambicioso proyecto en curso consistente en una serie de galerías con cúpulas sostenidas por pilares de neumáticos, en un entramado de árboles y adobe. En estas galerías Leonard pretendía mostrar a los visitantes la documentación del proceso de gestación de la montaña, de su historia. La montaña me maravilló estéticamente, pero es en su historia en lo que pienso con más insistencia desde que visité la montaña. Leonard, como un Sísifo que incesante construye a mano una montaña que se autodestruye, que insistente pinta capas y capas de pintura que van siendo absorbidas por el barro hasta desaparecer. Más de veinte capas decía que le había dado ya, y las que se le siguen dando desde su muerte. Pienso en Sísifo, pero no parece haber aquí un componente de castigo, de condena, de la tragedia propia del mito griego. Se acerca más al absurdo, al heroísmo, a la inutilidad y a la dicha, temas sobre los que habría que preguntar a Albert Camus en relación a sus reflexiones sobre el mito griego. Leonard se declaraba feliz haciendo su montaña. Su convicción y su fe daban razón a su tenacidad, a su perseverancia y su proyecto daba sentido a su vida. En Yelp hay más de setecientas cincuenta fotografías de personas que han visitado la montaña; apareció en la película de Sean Penn de 2007 Hacia rutas salvajes; también en el videoclip Birds de Coldplay y en millones de editoriales de moda (esto último a juzgar por los resultados arrojados por una búsqueda rápida en Pinterest). Una historia de fe, un monumento al amor, convertidos en icono pop. Este mundo de fantasía creado por Knight aparece también citado en numerosas referencias sobre outsider art, dentro de ese saco de difícil definición que algunos denominan también art brut (en palabras de Dubuffet) o ignorant style (para los entendidos en graffiti). Me meteré en este tema de puntillas, con la precaución de quién ha leído en diagonal la Historia de la locura de Foucault, y sabe dudar sobre lo que a lo largo de la historia se ha calificado como enajenación mental. Se habla de este arte en oposición al arte culto, con lo complicada y errática que esta oposición es ya de por sí. A partir de los análisis que leo sobre el tema me quedo con una idea: la del arte liberado. El artista no siente la presión constante de la innovación, la necesidad de reconocimiento y tiene desconocimiento total de la historia del arte y del contexto del arte contemporáneo. Los artistas tildados de ‘outsider’ son autodidactas, amateurs, no tienen formación artística, ni doctorados, ni másters, ni residencias, y se ven empujados por la imperante necesidad de crear sin descanso. A veces no tienen ni pinturas, ni materiales, y rayan paredes con piedras o bordan con hilos arrancados de sus sábanas. En muchos casos su actividad se inicia a partir de un suceso traumático, de un acceso místico o de una visión. En sus obras, la ornamentación crece de forma orgánica y es evidente la falta de planificación previa. Espontáneamente, las formas van deviniendo hasta construir un todo, en una improvisación constante en la que la composición es la suma de las partes. Un horror vacui les lleva a llenar el espacio de formas vegetales, formas orgánicas y redondeadas, conquistando todo el espacio sin saber cuándo acabar. La escritura aparece también con frecuencia en las obras que son clasificadas como ‘outsider art’, una escritura con un gran componente plástico y visual, cercano al graffiti, de características casi escultóricas, como en la montaña de Leonard. El reciclaje, el uso de los materiales al abasto de la mano y la construcción escultural y laberíntica me recuerdan a la Merzbau de Kurt Switchers, un collage en tres dimensiones. La dificultad de distinguir entre los elementos estructurales y los decorativos, con preeminencia de la ornamentación, son elementos comunes al proyecto de Leonard y de otros artistas calificados de ‘outsiders’. Los elementos comunes de lo que se ha venido a llamar outsider art con Salvation Mountain son evidentes, pero sea una obra de arte de este tipo o simplemente un maravilloso disparate, detrás de esta montaña se esconde la historia de una labor creativa incansable, un proyecto vital de gran entrega y devoción, de carácter alegre y vitalista, desinteresado en términos de éxito social y económico, y con la única misión de transmitir al mundo una idea de amor universal. Viniendo de la ciudad del paseo de las estrellas, de la ensalada de kale, de los cold press juices, del networking sin descanso y de las inauguraciones de red lipstick y champán del caro, el encuentro con la montaña resulta, como poco, alucinante. *(Nota al pie): Palabras de Moreno Villa al hablar de las aventuras y desventuras del extraordinario Dr. Atl en su obstinado estudio del volcán Paricutín.